Kick off your day with a shoreline sightseeing cruise! Listen to an interesting commentary andget the chance to spot some turtles! Once we arrive at our glass bottom site, head downstairs for unparalleled views through the glass of fish, coral reef, and one of Bermuda’s most famous wrecks, the HMS Vixen. After learning all about the undersea world, you’ll get a thorough snorkel briefing. Your captain will take you to a beautiful secluded and shallow water area. You can snorkel the coastline coral reef, float by the boat, or splash around in the shallows! 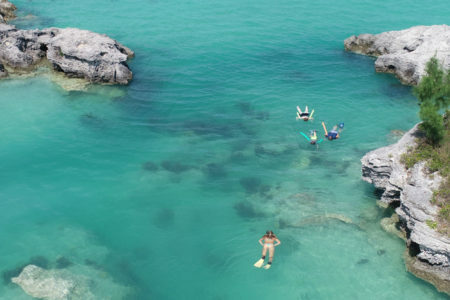 Perfect for snorkellers of any level of experience, this is a great chance to spend a relaxing day surrounded by Bermuda’s beautiful scenery, both above and below the waterline. Cash bar available on board. This tour is accessible to snorkellers of any level of experience and confidence! © 2019 Captain Kirk's Coral Reef Adventures.